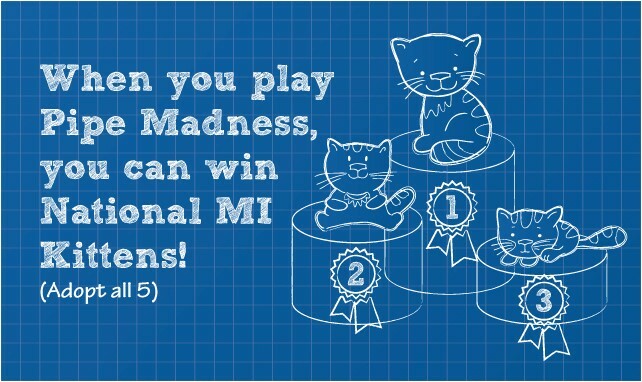 Pipe Madness 2 is about to get underway, and if you liked the puppies, you’ll be sure to like the National MI kittens. 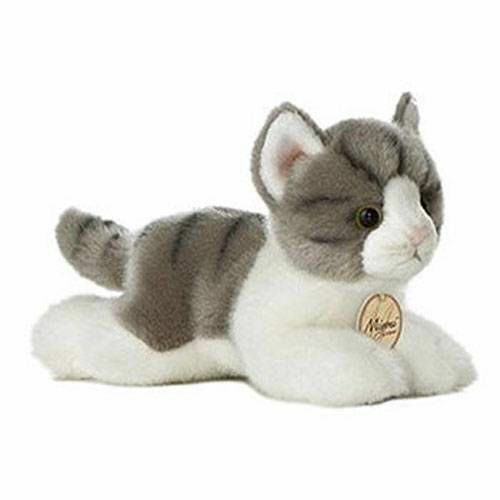 Each week we’ll post the Top 10 winners and show you the next weeks’ kitten prize. Help the National MI kittens break the internet. Join us on the Pipe Madness Facebook page to share your kitten and cat adoption stories, post funny anecdotes, or just join the conversation. Play the game, and you could win! Week 5 – Meet Paniz and the Top 10 Winners! Some kittens are the life of the party and this kitty is one of them. She is social, confident, curious and playful. She is ready to go, go, go although she does have mellow moments when she prefers special times with her human – could that be you? Visit our Facebook fan page to help us pick a name for our last remaining kitty and continue to play our Pipe-Madness game for a chance to win her! Week 4 – Meet Nala and the Top 10 Winners! Pretty Nala is looking for a home where she can be a treasured house cat. This sweet, easygoing and loving kitten who doesn’t ask much from her humans, except for a warm lap and some petting. Are you ready to pamper this beautiful kitty in return for lots of snuggles? Week 3 – Meet Cooper and the Top 10 Winners. Cooper is a bit on the shy side, like that really nice kid you knew in the third grade who took a little while to get to know. His favorite toy is a squeaky mouse and playing with him with it could be the way to turning him into a purring, playful love bug. Will he find a home with you? Week 2 – Meet Gilbert and the Top 10 Winners. 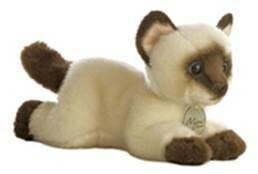 You may have missed Willow our graceful Siamese, but you have another chance to win a National MI plush kitten. Go to the Pipe Madness Facebook page and give us your name guess for the next kitten. He’s a “Prince Charming.” He loves attention, lots of petting and scratching around the ears, and is somewhat of a velcro kitty once he has targeted you as his best friend. This affectionate boy is very playful and loves hanging out with people. Orange tabbies are known to be among the most personable of cats – won’t you take this kitten with a big personality home with you? 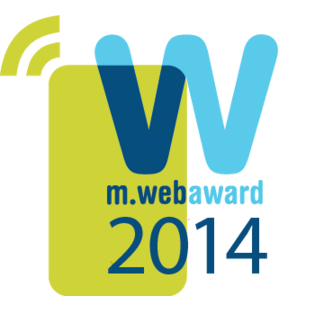 Week 1 – Meet Willow and the Top 10 Winners. She’s got a way about her. I don’t know what it is, but I can’t live without her. We hope you feel the same way about Willow when you meet her. Willow is quite the princess and so she has opinions which she is not afraid to share with you. But essentially, she has a loving, affectionate heart and will bond to you once she gets to know you. Are you willing to take a chance on this pretty blue-eyed gal? See winners from our previous Puppy Pipe-Madness game! 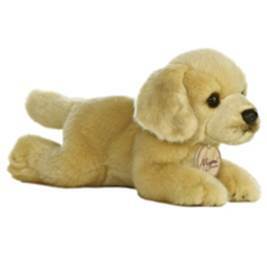 Meet Milo, he’s our National MI Pup available to adopt and win during the game week of March 26 – April 2nd. 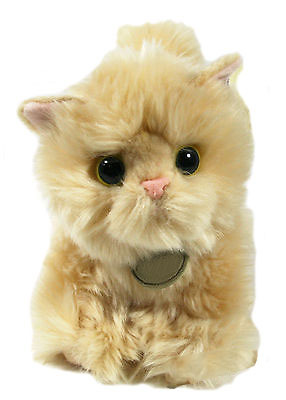 He’s one of 8 furry friends that we’ll be awarding as prizes over the coming weeks. 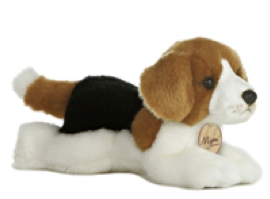 You’ve been playing the game and gaining experience, now rack up points to win a Milo beagle puppy. Your score could bring Milo to your office! Jethro, or Jet as we like to call him, is our next National MI pup up for adoption. If you can guess what breed he is, earn an extra 2,000 points. Also you can get 2,000 points for sharing your adoption story and an additional 5,000 points for posting a photo of your puppy. Frances is a big goofy girl who needs a home that will provide her with plenty of exercise, structure and guidance. 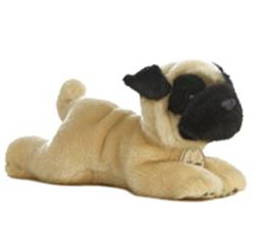 She love toys and playing ball, so invest in a “chuck-it” and this adorable gem will be yours for life. Frances is learning to be a model canine citizen and is very polite when meeting other dogs. If you are an active family looking for a special friend that will keep you smiling for years to come, take a look at Frances, she may be your dream come true. Love is a 4-legged word and Stella is playful and big cuddly example of it. She’ll make a fantastic sidekick and is loyal through-and-through. This sporty girl is social with everybody and loves to run and play, so long walks or hikes are right up her alley. Stella is young and eager to learn, and would do well with an active family and a doggy friend. Who’s ready to give this big bundle of joy a lot of hugs? This hot dog has never been told that he’s a little guy. If you are looking for a pint-sized buddy, Oscar may be the pup for you. He has a handsome smile and is always eager to say hello when you come home. He is animated and active, but also loves to curl up in your lap. This loving and playful guy is sure to put a smile on your face with his silly antics. Won’t you take him home? Finn is a very distinguished German Shepherd gentleman who would like to live out his golden years with you. He loves to be with people, walks well on a leash and is a wonderful ambassador for the breed. 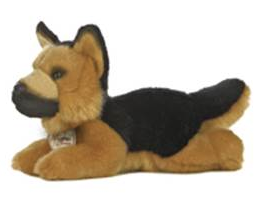 Confident, courageous and smart, German Shepherds are fond of children and are a true dog lover’s dog. Ready for a regal companion who loves a good scratch behind the ears? Is Finn your new dog? Potter is a kick! Don’t let his size fool you; he has a BIG personality. He is full of energy and loves to always be on the move. He likes to chase after toys, play tug-of-war, do zoomies in the yard, and snuggle in your lap. This little guy would be a great addition to an active family. He’ll keep you on your toes and with a lasting smile on your face. Ready to meet this feisty guy? Week 9 – Win Mia: Winners Announced! Fun, fun, fun – that’s Mia’s main focus right now. And to Mia, everything in life is fun. She has a youthful spirit and is a lot of dog with a lot of heart. As a Labrador retriever, Mia has a strong desire to please and is gentle, intelligent and family-friendly. This big girl with the brown eyes will bring joy and many smiles to your life. Don’t you want to have fun with this golden girl? Who can play? The game is intended to provide mortgage insurance education and fun for mortgage professionals (who are over 18 and reside in the U.S.). Forward the game link to your colleagues and encourage them to play too. There is no cost to participate. 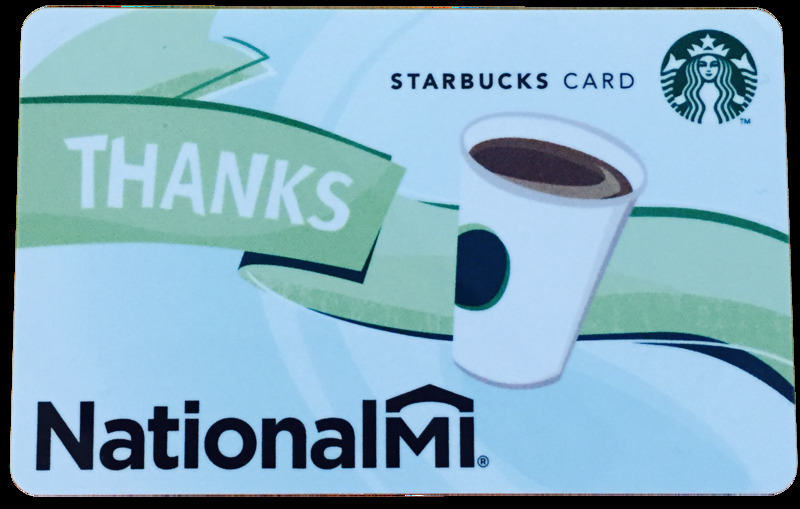 National MI will award promotional prizes, in its sole discretion, based generally on participation and game scores. All decisions by National MI regarding timing, frequency and prize awards are final. The game can be played multiple times, but National MI reserves the right to limit prize package to one per person. National MI has the right to discontinue the availability of the game (and prizes) at any time without notice.